Please send your donation today to help this Garden grow! We currently have nine babies resting at El Toro Memorial Park Cemetery in Lake Forest. The garden is located next to the children’s section, near the Angel of Hope statue. The American Golf Foundation (AGF) volunteer Ambassadors of Casta del Sol Golf Course in Mission Viejo have held 14 fundraisers in support Garden of Innocence - Orange County. We are so grateful for their involvement and support. It is AGF’s mission to promote the game through education, charity and community service. A big “Thank You!” to these wonderful volunteers. The Fundraising Chairperson, Norm Scott and his wife, Pauline, have graciously volunteered their time and hearts in support of the Orange County garden. They have also named baby, Kathleen, who rests in the garden. If you would like to visit the cemetery, drive towards the back of the cemetery until you see the Angel of Hope statue on top of the hill. 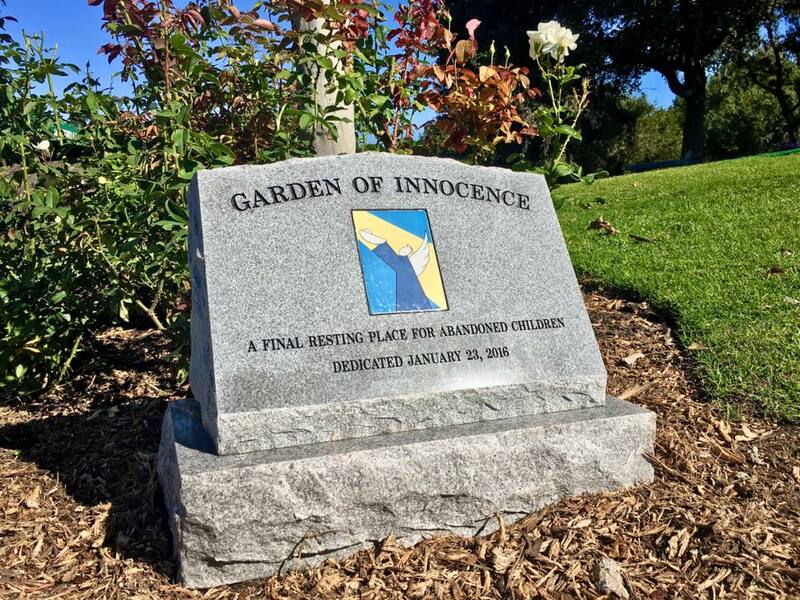 Garden of Innocence – Orange County is just left of the children’s section. There is a beautiful bench that was donated by the El Toro Cemetery District. The Garden of Innocence marker rests along the road next to the rose bushes. We would like to take this opportunity to thank the garden volunteers and the support of the community who has made these children’s final resting place of beauty and honor. Most importantly, thank you to the Knights of Columbus 4th Degree and the Orange County Sheriff’s Department for their partnership with Garden of Innocence. They have participated in every service, bringing the children the dignity and honor they so deserve. If you are interested in volunteering your time, or would like to donate, please contact the GOI Director, Marla Kennedy at (949) 922-3723. If you would like to donate, the mailing address is: 29851 Aventura Suite K, P.O. Box 80872, Rancho Santa Margarita, CA92688. We had a wonderful Dedication and 1st Memorial service at this new Garden in Orange County, CA. Our Garden was dedicated by Andrew Hamilton, the Mayor of Lake Forest, Ca in whose city the cemetery lies. Sergio Prince read a Proclamation from the office of Board of Supervisor Lisa Bartlett. The Trustee's of the Orange County Cemetery District, Leslie Keane and Cynthia Ward opened the Garden. Knights of Columbus, Orange County Sheriff Department Chaplains and Honor Guard along with four wonderful children escorted babies Aaliyah and Collette to their service. The children were Jack Burford, Ali and Julian Ringgold & David McCormick. Chief Senior Chaplain, Kathleen Kooiman of the OC Sheriff Department gave the opening prayer. Aldergrove Farms of Hillsborough, North Carolina provided the childrens urns. Luthor & Susie Nelson loaned us their doves and Kaila Moran donated the flowers. Budd Bales, Cemetery Manager & Tim Deutsch, General Manager pointing out the Gardens corners. Thank you so much to Tim Deutsch, General Manager of El Toro Memorial Park for presenting our Garden to the Board of Trustees and for their support of a Garden in this beautiful cemetery. 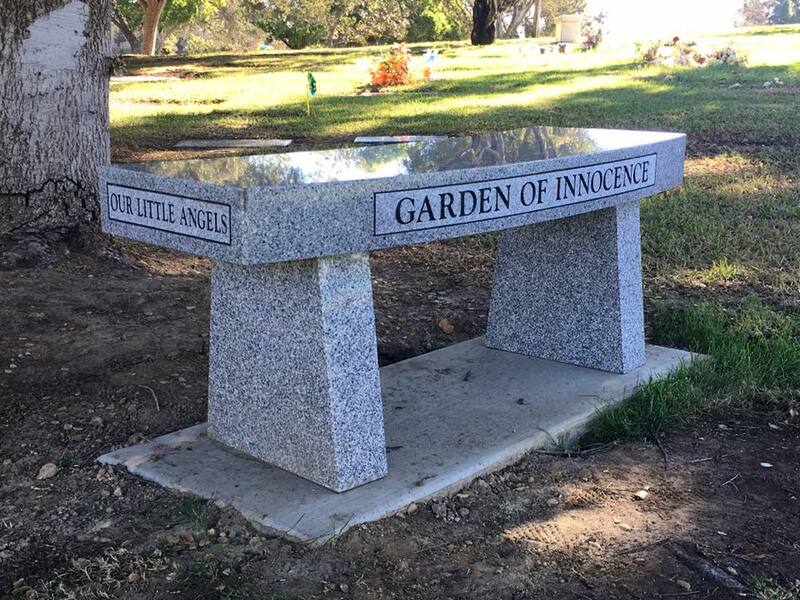 We are very excited to bring Garden of Innocence to Orange County, CA and to Coroner Kelly Keyes, Chief Deputy PA Elizabeth Henderson and Robert Mull for their trust. Marla Kennedy is the Director of this garden and very excited about taking care of all the babies in Orange County. She has been with the garden for over three years and has been waiting a very long time for this garden to get the approval of the county coroner. Marla, along with her husband Daniel love the Garden and enjoy telling their story, so please come to a service and introduce yourself to them. They are the parents of a beautiful daughter and are a shining example of what the Garden is all about....FAMILY! Late last year, we finally got approval and are ready to move on. If you are interested in volunteering for Garden of Innocence/Orange, please click on our volunteer tab and look at the positions that will be available and their discriptions below. If you see one that fits, please email Marla and let her know and she will let you know if it is still open. If you are wanting to help us for the pat on the back or what a good person you are then we don't want you, as it is not about YOU! We care for the abandoned children and give them the love and dignity they deserve and we want people with that same passion. Families come each December to read off the names of their child that they lost in a very moving ceremony. Angel of Hope is found only in this park and in Salt Lake City, Utah. We must remember all the children! We have many positions that need to be filled to make this garden run smoothly. Please look at the list below and see if any of them might be something you would like to try. We can't do what we do without our volunteers, so please help! For detailed information of what is involved in taking over this position, please visit the volunteer tab on the front of our website. If you see something you might like, please email Marla Kennedy at her email below.